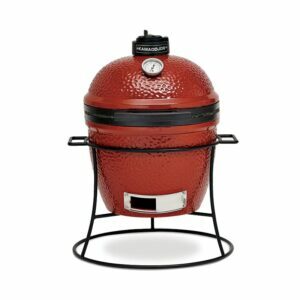 The versatile Big Joe from Kamado Joe is a grill, smoker and oven all in one, that can be ready to cook in 15 minutes. 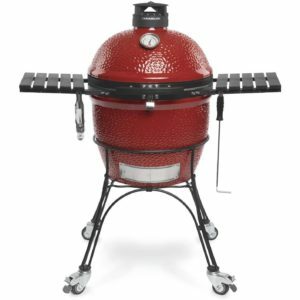 This kamado grill is constructed from 1 1/4-inch thick ceramic that holds heat, maintains temperature and is extremely porous to keep moisture in your meat, producing incredibly juicy, tender food with a true wood-fired flavor. With a 304 stainless steel cooking grate that measures in at 452 square inches, the Big Joe has one of the largest kamado cooking surfaces in the industry. Cook on two different levels at once using the flexible cooking system or use the two split heat deflectors for indirect cooking and baking for truly versatile cooking. The split fire box allows you to create two separate heat zones or only use one side of the grill for smaller meals. The patented Kontrol Tower top vent maintains a consistent air setting for precise temperature management, and it will not slip out of position as the lid is opened. The top vent is constructed with cast aluminum for superior resistance to rust. The dome lid and base feature a double thick, wire mesh fiberglass gasket which offers a superior air-tight seal and long lasting performance. The stainless steel lid latch self activates when you close the lid, ensuring heat does not leak through the seal. The fire grate is made of powder-coated cast iron for durability and superior heating performance, while the patented slide-out ash drawer makes cleanup easy. The air lift hinge reduces the dome weight by 96 percent, making it easy to lift the heavy ceramic lid with the high density polyethylene (HDPE) handle. The lid will also stay open at any desired position, allowing you to cook with the lid partially open if you choose to. The heat-resistant ceramic coating is sure to keep your grill looking as good as it performs and the matching side shelves provide a workplace for your grilling essentials. 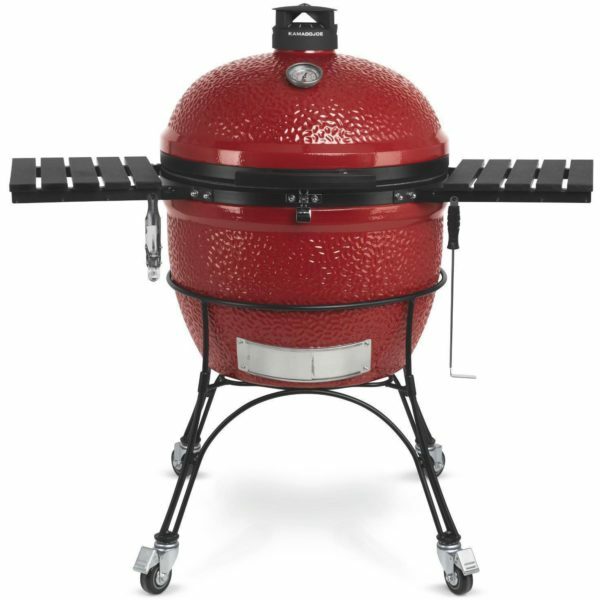 The BJ24 Big Joe Kamado grill comes with a free grill gripper for handling hot cooking grates and an ash tool for safely and easily removing ashes. This product pricing does not include shipping charges. All product is drop-shipped from the manufacturer by LTL carrier with Bobtail truck and lift gate. Using a pallet jack they can roll the shipment down a driveway. Note the Big Joe shipping weight is over 500 pounds and it is a two man assembly. Not included in the purchase price.